Our famous cotton candy pops are the perfect lil POP too add to any party, baby shower, wedding or event. Choose color/flavor of fluff and ribbon color of your choice. Comes on a 6in white lollipop stick. to any order for that extra WOW!! Our Fluff Balls are the perfect in between of a pop and bag in a perfect ball sized treat! What better way to reveal the gender of your little one than with with a sweet treat! we can customize one for you. Our pre packaged cotton candy comes in a few options heat sealed or ribbon tied. 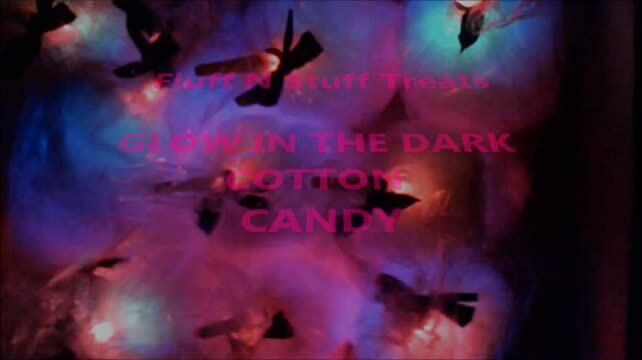 I mean as if cotton candy wasn't enough these Glow in the Dark cotton candy sticks kick it up a few hundred notches. We spin the cotton candy for you bag it and you insert the sticks before use. The colors are rainbow and can either be a steady glow, flashing light or up to 6 other variety's. These favors are for that extra special touch and are a perfect addition to any wedding, baby shower or party. Sundae cups stuffed with cotton candy are the coolest way to add something special to your party. Because of the nature of this product and being most of our orders are custom orders we do not offer refunds! If you have a problem with your order please let us know as we do offer a store credit on a case by case basis! We are not responsible for delays in shipping.